Having gained extensive experience performing and playing in Singapore, Thailand, Europe and the United States, Jennifer is fully equipped to take on projects and challenges in a wide range of differing musical genres. Jennifer’s passion and love of music started when her father played classical music to her at a very young age. Her performing arts journey started as a dancer in primary 1. After being a Liu Qin player for 2 years in a Chinese Orchestra, she then joined the secondary school band as a percussionist – and has been playing percussion ever since. Jennifer’s conductor, Mr Lee Seck Chiang, enthused his band members by the passion with which he taught and also by recounting the stories behind the music he chose for them to play. Her experience in these formative years allowed Jennifer to develop her musical expression and her love of playing music. Later on, it led to her decision to play music for a living. She played in school bands up till her final year when she obtained her Bachelor of Science degree with merit. 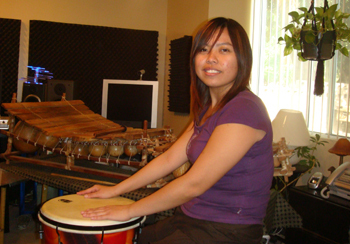 Then, while studying in Junior College and University she guest-played in a number of school bands and organizations throughout Singapore, and taught percussion part-time. She also gained experience in management of symphonic bands as a secretary, librarian, logistics officer and percussion section leader in different groups. Jennifer went on to teach music full-time as an Assistant Conductor and Percussion Instructor in primary and secondary schools, as well as with Motivate Music School. She studied on her own and obtained ABRSM Grade 6 Music Theory (Merit) and ABRSM Grade 8 Practical in percussion. After a few years, Jennifer decided to pursue for an MA in Performing Arts Management at New York University. In order to gain a wider understanding of the Singapore music scene, she worked for Tamagoh Productions as an artiste manager and events coordinator. However, during her time with the company, her strong desire to perform was fuelled by the many times she stood below stage, watching the musicians play in events, weddings and concerts. Eventually this experience led her to change her mind about her future career. In 2007, she applied and was accepted onto a full-time course in Drum Performance at the LA Music Academy (LAMA) in California. In 2010 she obtained an Associate of Arts degree when LAMA was finally approved by the National Association of Schools of Music to offer Professional Associate of Arts degrees in the United States. Her teachers in LAMA are top players in Los Angeles and United States, including Ralph Humphrey, Joe Porcaro, Jerry Steinholtz, Pete Korpela, Michael Packer, Matt Starr, Jerry Watts Jr, Dave Pozzi and many others! One of the best moments in LAMA was jamming with Abraham Laboriel & Greg Mathesion. Drum clinics, masterclasses and performances by top players in the world like Steve Gadd, Simon Philips, Tierney Sutton Band, Airto Moreira were inspiring and motivating. Jennifer started gigging around Southern California in 2009, responding to ads, auditioning and joining various bands and projects. 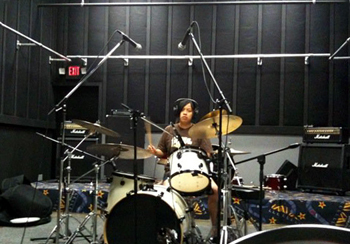 As a versatile and easy-to-work-with drummer, she worked with many singers and songwriters and with bands such as Natasha Wood, Pat Nason, Art Stucco and Rough Church, for live shows, demos and albums. She also played in a cover band, Whatever. In the same year, she joined an indie rock band, Chachi [chachi.us] as a drummer for live gigs and toured with them three times in California. In 2010 Chachi released their 2nd album, Enjoy The View, with Jennifer playing drumkit and percussion, and also singing lead vocal on one of the tracks. The official music video of Chachi’s 2nd single, Another College, was released recently, in September 2011. Around the same time the Still Moving Project Band was formed with Jennifer playing gigs as their drummer and occasional vocalist. During this time Jennifer performed in a variety of venues around Southern California such as House of Blues, Viper Room, Di Piazza and The Continental Room, as well as pubs, clubs, coffee shops, theatre productions, festivals and awards shows. Highlights of Jennifer’s time in California include playing percussion and singing background vocals with the New York-based band Skyebat at the Feel Good Film Festival in 2009, where Skyebat won the Best Original Song award. She also performed as a blues band drummer in an eight week production of the docu-play, How Katrina Plays, at the Write Act Repertory Theatre in Hollywood. In 2008, she worked with composer/producer George Nishigomi and performed on African percussion with Best World Music artiste, Nitza, as the opening act for the Hollywood Music Awards. This year, Jennifer has played on the debut album of Tze n Looking Glass, entitled Stories From Wonderland. One of the tracks she played on, An Indian Folk Song Meets Jazz, won 1st prize in the Instrumental Category of the UK Song writing Contest in 2011. Other tracks, By My Side and Fly With Me were semi-finalists in the Love Songs and Olympic Theme categories respectively. The California-based band, Rough Church has recently released its new album, The Wow Signal, also distributed under a New Zealand Label, with Jennifer playing percussion on several tracks. 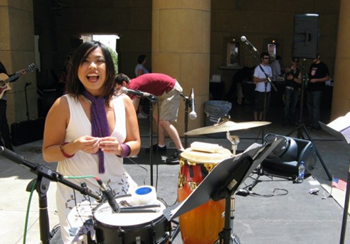 Based in Singapore, Jennifer is a gigging musician, drummer and music instructor, creating original music with local and international artistes. Currently she is playing in a number of projects including Piezo Qaurtet, Juice (cover band), Tze n Looking Glass, WindWorkz Big Band, City Swing Big Band and the Mus’Art Wind Orchestra.